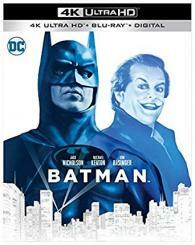 After a young boy witnesses his parents' murder on the streets of Gotham City, he grows up to become the Batman, a mysterious figure in the eyes of Gotham's citizens, who takes crime-fighting into his own hands. He first emerges out of the shadows when the Joker appears - a horribly disfigured individual who is out for revenge on his former employer and generally likes to have a good time, but the identity of the `bat' is unknown. Perhaps millionaire Bruce Wayne and photographer Vicki Vale have a good chance of finding out?